Please Note: Gratuities will be paid in advance ($88 per person will be added to your final invoice for gratuities to be paid to driver, guide, and hotel staff). Transfer to your hotel in Zurich with the remainder of the day free. Zurich is definitely a combination of the old and the new. It is divided (as are many European cities) into the modern cosmopolitan district and the Auld Stadt (old city). 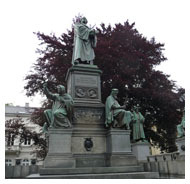 Most of the time during your stay will be spent seeing the sights connected with Ulrich Zwingli. It was in Zurich where the Reformed branch of the Reformation got its start under his leadership beginning in 1520. Today you will see his monument, the church where he was pastor (the Grossmunster), and the Fraumunster Church crypt which has an exhibition on the history of the Reformation in Zurich. Zurich is also the origin of the Swiss Brethren Anabaptist Movement. It had its start in the home of Felix Manz in 1525. 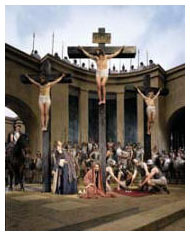 Its location is a few blocks from Zwingli's church. This afternoon you are free for some independent shopping before dinner. This morning we travel to lovely Lucerne for a fjord-like lake cruise and free time in the historic cobblestone shopping district to shop for watches. 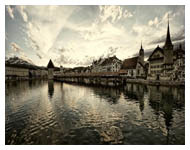 We also enjoy a brief walking tour of historic Lucerne displaying medieval heritage every step of the way. See the impressive city walls, the famous covered wooden bridge, ornate patrician houses lining cobbled streets, and Thorwaldsen's masterful Lion Monument. We have the remainder of the afternoon free to explore the main streets of Lucerne before our drive back to Zurich. En-route we take a leisure drive through picturesque landscapes. This morning we will travel to a resort town on the border of Germany and Switzerland, Constance. Some historians suggest that it is here that the Reformation actually got its start in 1415, with the execution of Bohemian reformer John Huss. You will see the house in which he faced his accusers and the place just outside the main town where he was burned at the stake. We arrive in Munich. 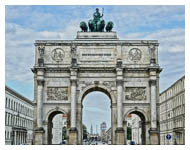 Our sightseeing begins with a driving tour of the city including outside views of the Olympic Stadium, Pinakotheken art museums, Royal Palace (Residenz), National Theater, and the world famous Hofbräuhaus. Take a walking tour of the Marienplatz which lies at the heart of the Alstadt in the city center. This lively, attractive square houses the Gothic New Town hall (Neue Rathaus) with its famous Glockenspiel and the Old Town Hall.